Today, Drew and Spencer are discussing Jean Grey 1, originally released May 3rd, 2017. As always, this article contains SPOILERS. Drew: Ah, the solo album — is there any more fraught trial in popular culture? Making it as a solo act is a grueling process, and while most never rise above obscurity, artists who are already well known for their work with a band have the blessing/curse of starting their solo career in the public eye. It requires instantaneously landing on a musical voice that’s somehow familiar enough to appeal to longstanding fans (capitalizing on that notoriety) yet also distinct enough to justify the solo status. 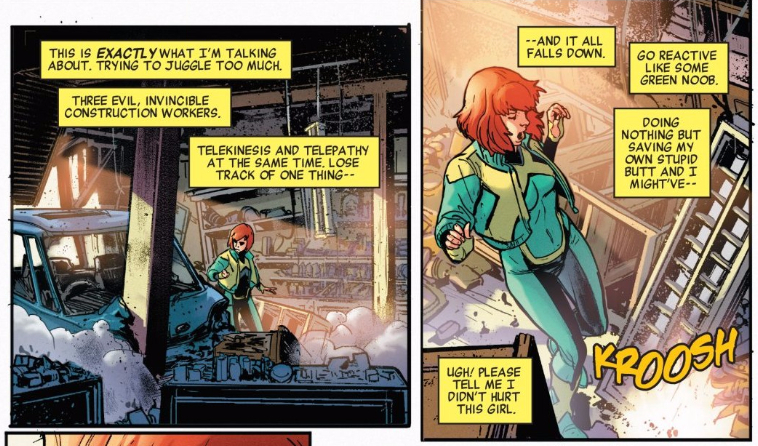 Dennis Hopeless and Victor Ibáñez face a similar tightrope in Jean Grey, aiming to give the (in)famous X-Man a voice that could distinguish this series from her other adventures. She’s not just worried about distinguishing herself from her fellow X-Men; she’s worried about being confused with the other, much more well-known version of herself. “Not that Jean Grey,” she says, acknowledging that that Jean Grey is the first one everyone thinks of. Moreover, that Jean Grey takes up significantly more space on the page, threatening to completely overwhelm the young, unassuming girl who is actually at the center of this series. 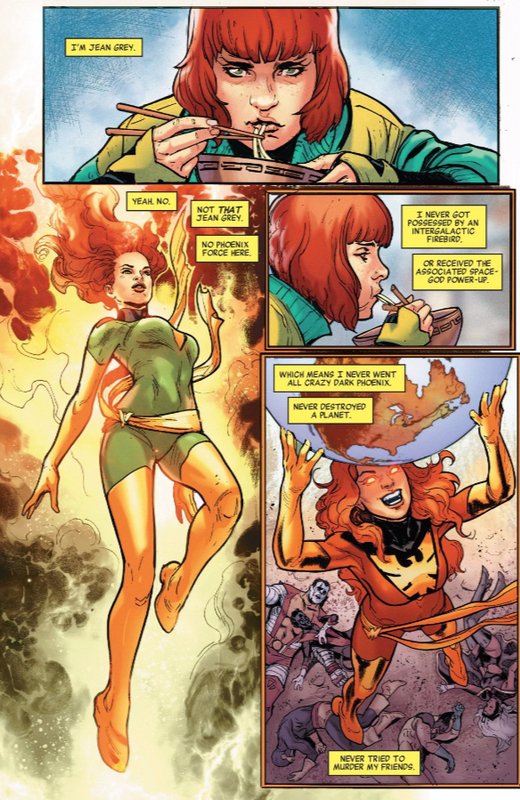 That Jean Grey gets iconic, menacing poses, while ours kind of spaces out while chowing on some ramen. As her introduction continues, we learn that she’s also looking for some independence from the X-Men, who she describes as “filthy weirdo brothers” — she loves them, but she also needs some space. That need brings her to Tokyo, where she’s enjoying brunch with one of those BAMF demons. That is, until they’re interrupted by an armored car robbery. Jean quickly leaps into action, protecting pedestrians and generally stopping the baddies, but is a bit overwhelmed. Here again, Hopeless and Ibáñez are emphasizing the elephant in the room, acknowledging that Jean really isn’t as effective a peacekeeper on her own as she is as part of the team. Still, she has to mark time until her teammates arrive, struggling to keep the situation under control. Jean is in a bit over her head, and the arrival of a mysterious, taunting voice gooses her discomfort. Just when it seems she’s won the day, that voice reveals itself to the the Phoenix Force. Except, only Jean can see it. It’s a decent hook, but I have to admit, I’m largely underwhelmed by the thought of Jean grappling with the Phoenix Force yet again. The familiarity of the Phoenix Force may be mitigated by whatever wrinkle it is that keeps everyone else from seeing it (maybe it’s just in Jean’s head, for example), but to me, the bigger crime is that it makes Jean less of the active hero and more of the passive victim. “Jean versus the Phoenix” isn’t about Jean’s choices, it’s about fate — it’s not something she does, but something that happens to her. I trust Hopeless a great deal, and I’m sure he has much more planned than I can anticipate, but in the meantime, I kind of wish Jean’s first act of going solo had been a bit more active. Here again, “Jean versus the Wrecking Crew” was something that happened to her, rather than reflecting any of her own wants or fears. That Jean would leap to the defense of innocent bystanders is certainly important characterization, but is also something we might be able to take for granted because of her role on the X-Men. Hopeless already has a solid voice for the character, but we don’t get to see that character illustrated at all through action — she’s largely reactive. I don’t know, Spencer, am I just asking too much of this first issue? I think Jean being forced to confront what has already been compellingly portrayed as her worst fear certainly has potential, but I’m also wary of how much baggage it saddles this series with. Do you see that as a big hurdle to overcome, or am I blowing it out of proportion? I’ll admit that I may just be disappointed that this isn’t the series I pitched myself about Jean Grey — a story about a time-displaced telepathic teenager just feels like it should be more fun than a dour meditation on destiny will allow. Is this what you were expecting? Spencer: Maybe not expecting, but I can’t say I’m all that surprised to see Jean Grey grapple with the Phoenix. It’s not only a central part of Jean’s character, but tied into her fraught relationship with her future self — the very relationship that has defined the original X-Men ever since they were brought to the future. It is a lot of baggage, but I imagine quite a few readers were going to bring that baggage with them to a Jean Grey title no matter what. The way I see it, there are two approaches you can take here: ignore the baggage completely and try to build Jean up as something interesting on her own, or confront it head on and show how that baggage doesn’t define her, perhaps even how she transcends it. I’m legitimately unsure of which approach I prefer, but Hopeless has obviously chosen the latter. Talk about the opposite of grandiose; this sounds more like a cocky kid than an ancient, indestructible entity of pure psychic power. So what’s the deal? Has the Phoenix been fundamentally changed on some level? Does the Phoenix have someone working with it, perhaps its own Herald? Or is the entire premise flawed, and someone is simply tricking Jean? 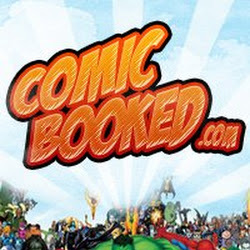 A part of me does hope that it’s a con, simply because the Phoenix is such an overwhelming, all-consuming presence, not just in-universe, but in whatever title it shows up in. 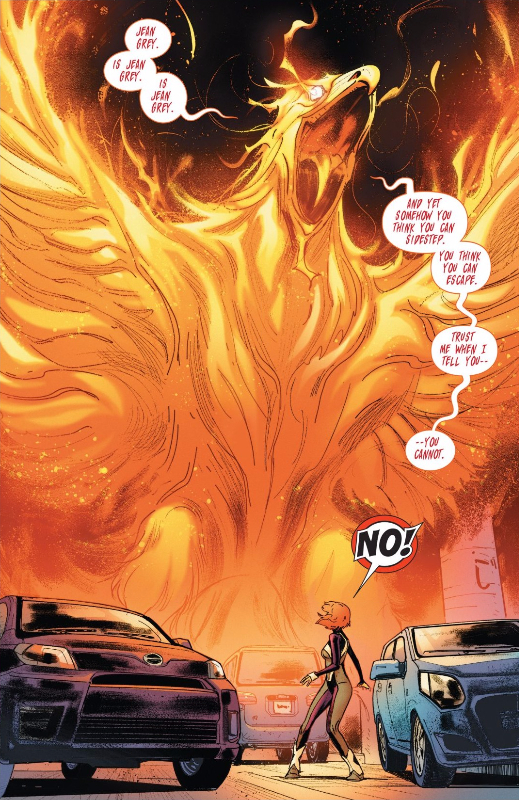 A Phoenix fake-out would allow Hopeless to take Jean in a fresher direction while still taking advantage of the opportunities to explore Jean’s fears that the Phoenix creates. After all, the Phoenix is far from Jean’s only fear — while she’s clearly terrified of it, she also credits the “grown-up, badass, seen-and-done-it-all Jean” as giving her nightmares a few nights a week. Jean’s fear isn’t the Phoenix specifically, but what it has to say about her future and her destiny — the Phoenix is simply a physical manifestation of Jean’s identity issues. Those issues play a major role in how Jean views herself. Drew’s right that Jean’s largely reactive rather than proactive in this issue, but that’s her entire approach to life in a nutshell. Jean’s at that young age where she’s still trying to define and understand herself, but throughout this issue we only see Jean define herself by what she isn’t. The best comparison I can think of is a kid who makes choices simply because it would piss their parent off, or simply because it’s what their parent wouldn’t do. That kind of rebellion is natural, but it doesn’t exactly leave a child with much of an identity of their own. If this winds up being Hopeless’ only metric for defining Jean as a character I’ll be frustrated, but I get the feeling that, like most kids who go through this kind of phase, Hopeless is allowing Jean to test her boundaries and broaden her horizons by figuring out who she doesn’t want to be, which should eventually allow her to better discern who she does want to be. In the meantime, though, it’s making Jean a bit of a wreck. I appreciate how Hopeless and Ibáñez characterize Jean as sweet, caring, and thoughtful; she doesn’t just rescue people, but genuinely cares about any collateral damage she may cause, which isn’t something you can say about 99% of superheroes out there. That said, she’s also scattered and easily overwhelmed. Yes, Jean has a decent excuse to be flustered here, but at the same time, her internal monologue is positively dripping with self loathing. I get the impression that much of her frustrations come from her own high expectations, both of who others expect her to be and who she’s trying not to be. She never gets to simply be Jean Grey because she’s too busy worrying about the many preconceived notions of who Jean Grey should be. I hope Hopeless and Ibáñez can find a way to break Jean out of this vicious cycle and show us exactly who our young new Jean Grey is, even if it they’ve got to sift through her significant baggage in order to reach that point. Honestly, Drew’s criticisms of the passivity of Jean Grey are completely right. And is the exact problem. Jean does do anything, just has things done to her. Even worse, she doesn’t ever react interestingly. A good portion of this fight was a fight scene, and while I give the team lots of kudos for attempting to have a rapidly changing situation with a focus on exploring the collateral damage, I can’t say it was done well. Part of this comes down to the art. Between the lack of geography and the tight panelling, turns feel less like natural cause and effect, and more like convenient shifts in the battle to keep things going. And that’s ignoring more work like the part where we are supposed to think that the house collapsed on Jean, which focuses so much on the civilian that we get surprised at the idea that the Wrecking Crew thought she could be dead. But even worse, I find myself constantly wondering why Jean hasn’t already solved the situation. The book is very clear that Jean has limits, but does such a poor job expressing those limits. It makes it look like Jean s just doing the wrong moves so she doesn’t win too quickly. How about Jeam tries something beyond her abilities, and it goes wrong? How about she tries to suspend all three members of the Wrecking Crew in the air, but can’t hold it. It did a very bad job making me interested in the character, which makes her vision of the Phoenix (I’m sure the Phoenix wasn’t there. Instead, Jean was having a premonition/feeling its psychic presence) even worse. Yeah, we are going for Rebirth level boring plot points, and Hopeless can’t even get me interested in the character?